So, a while back I wrote a not quite complete article on UV filters. To do that, I had to buy new testing equipment and learn to test filters. This was not what I wanted to do when I grew up. But somebody has to do it, and I did get to buy new toys. Like a metaphor for my life, the results ended up being the opposite of what I expected. I thought if we found tons of differences testing simple clear and UV filters, there would be many more differences in more complex polarizing filters. So today, instead of showing you amazing differences between the various brands, I’ll just save you some money on your next CP filter purchase. That should work out for both of us: you save money, I get a shorter blog post. I should mention our methodology has improved somewhat since we did our first filter article. I used a red laser to measure transmission then, and several people made the very reasonable suggestion that a green laser might be a better choice, being in the middle of the spectrum and all. Other people said I should get a spectrometer and measure the entire spectrum. So I did both of those things. If you’re thinking about buying a circular polarizing filter, you probably want to know which ones polarize the best and which ones the worst, right? I know I did. Now we could have just gone outside and taken pictures in the bright sun and said this one’s good and that one’s bad. But we never do anything simple when we can complicate the crap out of it. So what we did was take our laser transmission set up and modified it a bit. Primarily, this shines a laser into a power meter and gets a reading. Then we can stick mostly transparent stuff in the beam and see how much it reduces the power reaching the meter. 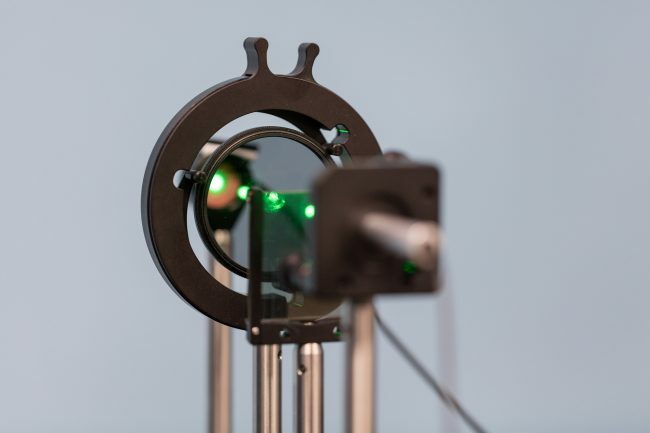 Excellent lasers are almost entirely polarized, but I have a budget, and that budget didn’t include (much to my sorrow) $10,000 for the lab-grade, steel-melting laser I wanted. I got a little 5-mwatt green (530 nm) diode laser. It’s sort of polarized. So we shined that laser through two sheets of polarizing film, each of which have a 1,000:1 polarizing extinction ratio. So basically, the light that passed through the film was really, really polarized. Then we put the filter in the beam of polarized light to see how much light it let through in the open position. For now, we’ll just call it ‘most of the light.’ Finally, we moved the lens to the polarizing position, which should have blocked all of our polarizing light if the filters were really effective. Here’s where I expected to put a table showing how efficient the polarizers were. Instead, I’ll just tell you that all of the polarizers we tested blocked all of the light, within our capabilities of measurement. They were all at least 99.9% efficient at doing their job, polarizing light. There’s something you don’t see very often; a photography product that completely does what it says it will do. 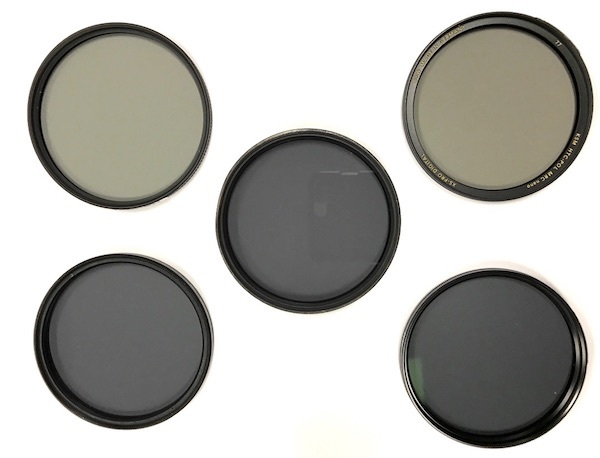 When we tested UV filters, we found several for which the glass wasn’t flat. We repeated the test on all of the CP filters, and all passed with flying colors, so I won’t bore you with repeating it. Again, my expectation was with two pieces of glass we might see more, not less, bad glass. But no, they all passed just fine. That may be that better glass is used in CP filters, or the polarizing effect evens things out. I don’t know. But they all passed just fine. If you’ve ever used a CP filter you are probably aware that even when not polarizing it absorbs some light. You should be aware of this because, well, it’s darker when you look through it. We thought it would be worthwhile to see how much light it does absorb. Why? Well, partly because we had that laser transmission bench already set up, but mostly because two of these filters claim to let more than 99% of light through. The Marumi claims it lets 99.4% of light through, and the B&W High transmission says it passes through 99.5%. No, I’m not a rocket scientist, I’m just a regular scientist. But high-tech scientific principles tell me that since everything looks a bit dark when looking through these CP filters, it’s unlikely that more than 99% of the light is passing through the filter. But maybe that’s just me being cynical. Or maybe there are alternative facts that say darker isn’t the same as less light. Anyway, since I was rather fired up and my BS meter was pegged at full maximum, we removed the linear polarizers and measured absolute transmission for each filter in the non-polarizing position. If you remember, when we tested clear filters the best let 99% of light through, the worst was down around 90%. Now, the Marumi and B&W are nowhere close to 99% transmission, but I will admit that they did indeed have higher transmissions than the others. Some, probably most, people don’t care about how much ND effect their circular polarizer has, and if they do they may well not want the higher transmission variety, they’d prefer a bit more light blocking. After all, if you need a circular polarizer, you probably are shooting where there is lots of bright sunlight. But the takeaway message is that higher transmission filters do tend to give more transmission. Just not as much as is claimed. It’s taken several weeks for us to get things calibrated and running, but this post seems a good place to start using our new spectrometer. 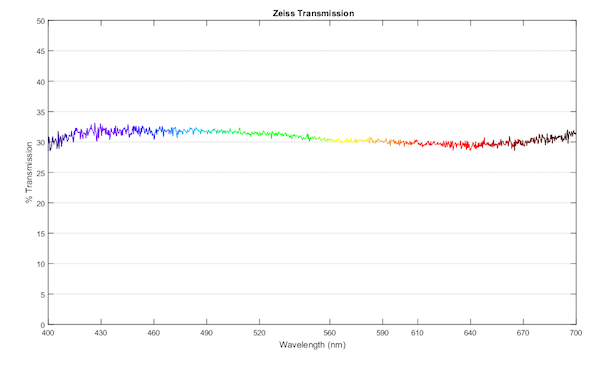 We know that some polarizers give a bit of color cast, especially when polarizing, so we thought it would be interesting to see look at their transmission spectra. We looked at transmission both in the open and polarizing position and did not see any changes with these polarizers. I’m told there are some that do have a color change with polarizing. 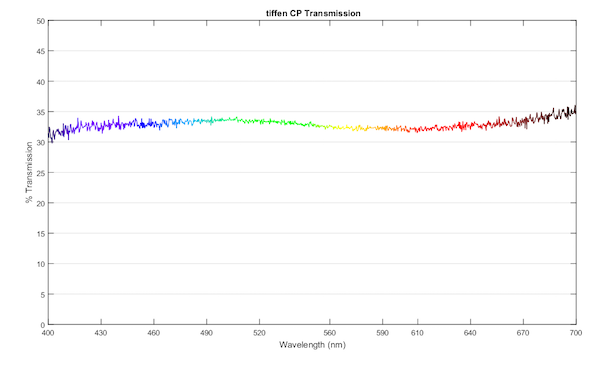 I’m only showing you one spectrometry report for each filter, to keep this short post short. Also, don’t put much stock in the absolute transmission between the filters. We weren’t testing for absolute transmission since we’d already done it; we just wanted to look at the curves. 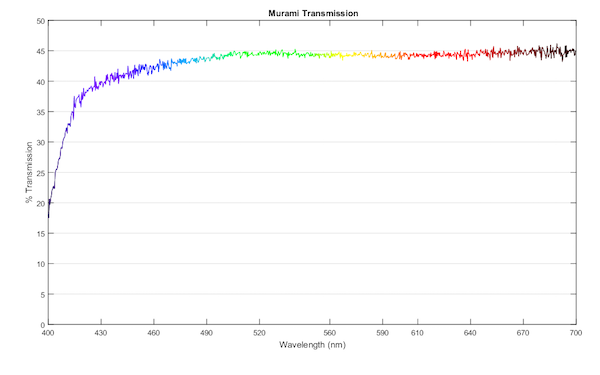 The Marumi and B&W filters have similar transmissions and very similar spectra. Both tend to have some UV filtering activity and drop off a little bit at the blue end of the spectrum. These all have a stronger Neutral Density effect than the first two, and their spectra are different, too. The Sigma, Zeiss, and Heliopan filters are all very similar with a bit more transmission at the blue end of the spectrum and a bit less in the red-yellow range. The Tiffen has a similar pattern, although maybe a tiny bit more of a green peak. So What Did We Discover Today? Well, several things, one of which is really useful. So I’ll get that one out of the way first, and then let this post just steadily deteriorate. If you are buying a circular polarizing filter because you want some circular polarizing, it doesn’t seem to matter much which one you choose; they all polarize like gangbusters. So I saved you some money today. Oh, and BTW – I know what you’re thinking. 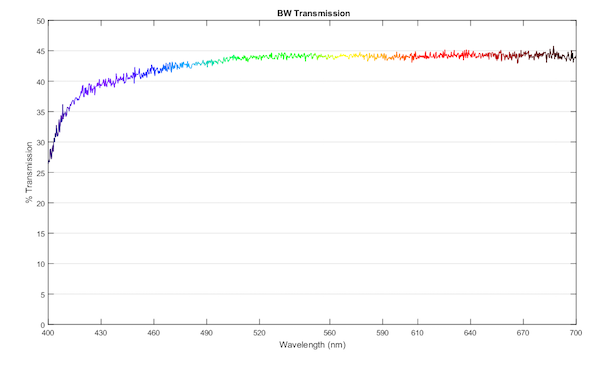 Yes, I’m going to publish spectrometry reports on the clear and UV filters we tested in the last article. Next week, I promise. I need a few days to recover my pride. Several people made the very pertinent comment that they would expect some effect in sharpness and contrast. FWIW I took a moderate telephoto, very sharp lens (Batis 135mm f/2.8) and MTF tested it first with no filter, then with a B&W Multi-coated clear filter, then 4 of the CP polarizing filters we tested above. The clear filter made absolutely no MTF difference. 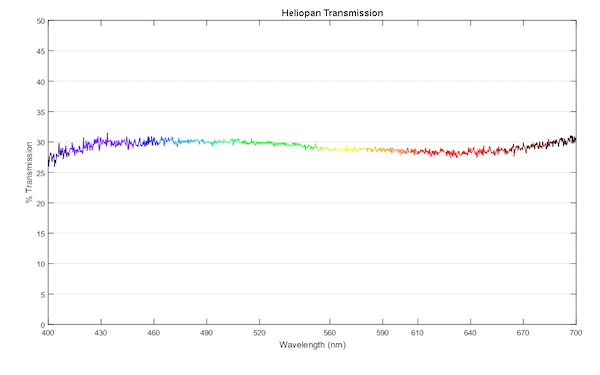 All tested polarizers (B&W, Marumi, Zeiss, Tiffen Ultra, and Helipan) caused a slight decrease in MTF at high frequencies. There was no detectable change at 10 and 20 lp/mm. At 30 lp/mm there was a consistent 1-2% drop, at 50 lp it was about 4%. All of these CP filters were very similar, I could detect no difference between them. This is a quick, off-the-cuff check. I’ll look at things in more depth when I have time. But the bottom line is fine detail in photos is affected a bit. I don’t find that the least bit surprising. I’ve also ordered a couple of $40 filters and we’ll see how those compare. I told a customer that his Switronix PowerBase 70 battery needed to charge “for a hot minute” on a tech support call today. I amended my advice once I realized that “a hot minute” was neither quantitative nor helpful. At any rate, the customer seemed to find it charming. On a side note, I’ve never been called out for saying, “y’all” on a phone call. Well, a polarizer is a polarizer and a waveplate is a waveplate. 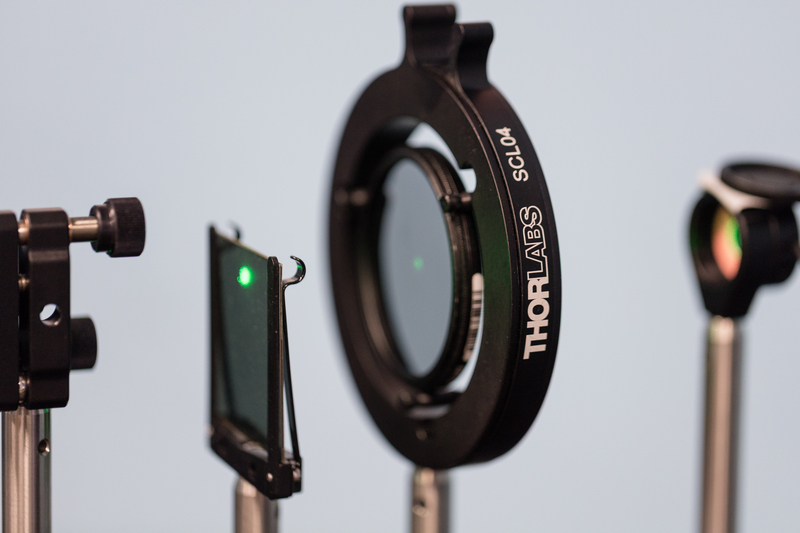 On thorlabs, thin film polarizers have about 80% transmission for the state they select, and about 40% for unpol light (no surprise there, ~0% for the state they block and 80% for the state they select, average the two). I can’t find transmission numbers for a 1/4 waveplate, but a quartz or calcite crystal is clear to the eye so it is pretty high. To find what is reflected and transmits to flare/stray light and separate that from absorption, we would need a scatterometer. They’re $80k and would serve no purpose to us except for testing filters. Not likely to happen. Yes I realized after I posted I omitted the absorbtion part of this. I’m not an optical engineer and really didn’t want to deep dive into the physics. You say that it’s a huge part but the question begs, how huge? Looking at the pictures I’d say some filters are definitely darker than others. Time for more measurements. Light that is not transmitted is either reflected or absorbed. For the components of a CP filter (linear pol & 1/4wp), absorption is a pretty huge part. How about “Y’all hold my beer and watch this”? This can introduce moisture into the lens. I use wide rubber bands wrapped around the filter. Works like a champ. Light that isn’t transmitted is reflected. If you are stacking filters that reflected light can start bouncing around your filters creating all kids of undesired effects. Transmission efficiency does matter. Also it’s B+W. We’ll only start worrying when “Like” starts the sentence. Every sentence. So (he-he), I’ll say their stuff needs a thorough examination in the near future, because I almost bought one instead of B+W. BTW, your testing is, like, bitchin’–THANK YOU! Or wrap a wide rubber band around it, pull tight, and turn. And — Thanks, Roger. Informative, useful and fun. Did I miss something, or did you not test for the “Circular” part of CPL? You tested for the proper selection of one linear polarization direction on the input, but did nothing to measure the amount of residual linear polarization on the output. Only then you can draw your conclusion that every filter does exactly what it is supposed to do. You should try to put a linear polarizer behind the fut (filter under test) and see if there is any difference in transmission between different orientations of the second filter. The difference between minimum and maximum transmission divided by the sum should give you the amount of residual linear polarization. 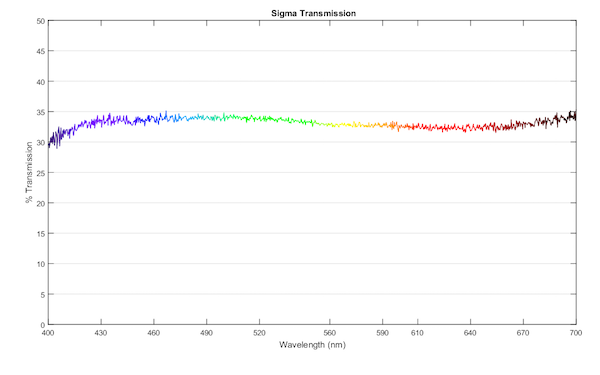 BTW: Did you check that your sensor is equally sensitive to all possible light polarizations? The number of stops lost is log2(100/t), where t the is the transmission percentage. So for 90% it’s log2(1.111) or about 0.15 stops. Since most calculators don’t have logs to the base 2, you can use log(100/t) / 0.3 instead, where log is base 10 log. When they started rotating the Venn Diagrams, I passed out. I am now in a dark place……. The key to usage is intentionality—if the writer is conjuring a specific effect by starting a sentence with for, and, nor, but, or, yet, or so, that would be an appropriate use. If a forbidden word appears because the writer is just fumbling around for a different way to start a sentence, then it’s wrong and the perpetrator deserves a long stretch in grammar prison. 4% reflection is for the fresnel losses of an interface of two mediums having a refractive index of ~1 and ~1.5. Different technologies to achieve polarization and achieve the conversion from linear to circular polarization are used by some of these filters compared to others. Some of those technologies are most costly to the transmission of polarized light than others. It seems to be strange to observe such HUGE deviation in transmission among aforementioned specimens! It is close to impossible to obtain the polarizing film with such a low transmission of polarized light (garbage in another word). The only explanation would be in reflections between glass-adhesive-film-adhesive-glass interface. Then when you add up about 4% REFLECTIONS FROM EACH INTERFACE (I ASSUME THEY DID NOT USE materials with matching RI then everything looks quite possible! But then one will inevitably get a high level of hase thus reduced sharpness and reduced contrast. OK, on further thought, I’ve made some assumptions with that and they may not be pertinent. 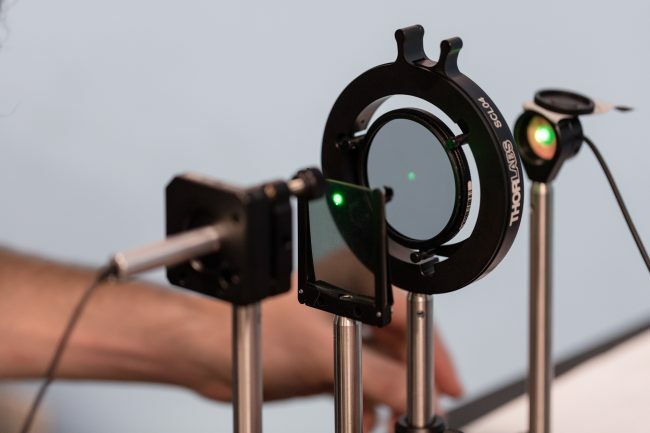 I’m going to run CP filter tests on known lenses on the MTF bench to make sure. You have a very valid criticisim. Thanks Mike, I thought most people knew of those tests, but glad to have the link up. Conjunctions connect one thought to another, and thoughts, thankfully, don’t have to be included in the same sentence to be connected. I believe teachers started telling their students to stop doing it because they were tired of reading papers that had every sentence start with “and.” It’s easier to tell little kids to not do something at all than it is to teach them to do something sparingly, and thus a fake rule was born. That’s for doing this. Polarizers are a important part of photography, so having more info really helps. We’ve tested a ton of filters, even bad ones, on the MTF bench. If they weren’t plane parallel we’d have expected some change in MTF side-to-side, but we’ve never seen one bad enough to do that. Irregularities in the glass seem to have the much greater effect on images. Stefano, we did the same ‘distortion of pinhole’ testing we did with the UV filter. All of these passed easily, which I mention in the text, but didn’t want to take up the space of posting all the images. Exactly. I will try to add some cheap ones and maybe some color-changing ones. This was one of those “here’s the test I need to do so I’ll show you what I have” posts. Isn’t the first property of a photographic filter to have plane and parallel faces? Is there any way to measure that? Thx! my main concern with polarizers is that they could affect the resolving power of the lens and the level of sharpness in my photographs. I never looked thoroughly into this but noticed it sometimes, especially with the wide angles. Have you made or plan to do any measurements about that, Roger? Nice to see a test of CP filters, that taught me to use whatever I can get hold of, at the best price! If someone want to give me a Marumi, OK, but I would not say no to any of the other! A professor of linguistics was once explaining emphatics in certain languages and dialects and discussing double negatives and double positives. He made the statement that in English, a double negative is actually a positive — not more negative — and that the double positive does not exist at all as a grammatical construct. You can make a thin film monochromatic waveplate. You cannot (or rather, no one has) made a thin film achromatic waveplate. Those films essentially make a small cavity with interference that allows perhaps millions of trips back and forth for the extraordinary polarization state in the coating, building up 1/4wave OPD. This is extremely sensitive to the wavelength, where a birefringent crystal (or other material…) naturally is reasonably achromatic. The polarizer can be a thin film. There are many common ways used to make them.